This overland tour offers a 'one-in-a-lifetime' opportunity to track chimps & endangered mountain gorillas, as well as visit the famous Masai Mara & Murchison Falls National Parks, with their amazing wildlife. Travel in a rugged overland truck by day & sleep in simple rest camps. English speaking guide, activity package, park fees, chimp & gorilla permits included. Group size 4 to 18. You will be met at Nairobi Airport and transferred to your accommodation in this bustling city. Check in and relax in your warm and friendly African surroundings. This morning your exciting group adventure tour starts from Nairobi, travelling across East Africa in a rugged 4x4 overland truck. The first part of your tour operates using a safari-type vehicle, so for this reason you will be asked to pack a small overnight bag with towel, clothing, toiletries and camping essentials. We then travel 5-hours to the Masai Mara National Park, named after the Masai people and the Mara River, which divides the park. Masai Mara National Park is famous for its exceptional population of game and the annual migration of zebra and wildebeest from the adjoining Serengeti National Park. This phenomenon occurs every year from July to October, when game migrates along a circular route from the plains of the Serengeti to the Masai Mara and back again in search of fresh pastures, followed by hungry predators - most notably lions and hyena. Enjoy an afternoon game drive in this magnificent wildlife sanctuary, with optional opportunity to visit a local Masai village. Regardless of lodge meal plans, all your meals are included whilst on tour and will be prepared & served from the overland vehicle - except for specified optional dinners in cities. Alcohol is not included. Accommodation varies and includes lodges, hotels, hostels, chalets, permanent tented camps and traditional huts. Bedding is provided, but you do need to bring your own towel, sleeping bag and headlight. Truck lockers are 30 x 80cm, so please use soft bags that will fit (but there is no weight restriction). Shared ablutions at tented camp. Please be aware that accommodation sometimes has to be substituted for operational reasons. Average group size is 14 people (with minimum of 4 and maximum of 20). On accommodated tours the average age is 40+, with a range from 18 to 55 years although this does vary by tour. If over 65 years, you need a doctors letter that you are sufficiently fit for overland travel. Teens aged 16 to 18 years are on request and must travel with an adult. Today is dedicated to game viewing on the open plains of the world famous Masai Mara. Nestled within the enormous Great Rift Valley, Masai Mara National Park is famous for its many prides of lions, packs of hyena and other predators - as well as huge herds of wildebeest, which number over one million, zebra and giraffe. All the Big Five can be seen here, as well as numerous other species including the Thomson's gazelle, topi, kongoni, impala, roan antelope and hippo. The nocturnal bat-eared fox, rarely found elsewhere in Kenya, also inhabits this park as well as the endangered cheetah and black rhino. Bird watching is also excellent with over 450 different species including the vulture, marabou stork, secretary bird, hornbill, crowned crane, ostrich, long-crested eagle and african pygmy-falcon. We rise early and enjoy our final game drive through the Masai Mara before heading to Lake Nakuru National Park where we will enjoy an afternoon game drive through the park. A soda lake on the floor of the Rift Valley, at certain times of the year Lake Nakuru is home to many flamingos and over 400 different bird species. The lake is also a haven for certain endangered species including the Rothschild giraffe and black and white rhino. A full day on the road today as we leave Lake Nakuru and travel 8 hours to Jinja - the second largest city in Uganda, situated at the source of the River Nile. We cross the equator this morning, before continuing across the border to Jinja. After a quick stop in the capital city of Kampala, we travel 8-hours in our rugged overland truck to Murchison Falls National Park. This verdant reserve was favoured by Winston Churchill, who called Uganda the "Pearl of Africa". This wildlife-rich game sanctuary is situated on the banks of the River Nile, downstream from the famous waterfalls after which it was named. It is the premier game reserve in Uganda and one of the best wildlife conservation areas in the whole of Africa. After settling into your accommodation, your guide will brief you on the activities for the following day. This morning enjoy chimp tracking in Budonga Forest, the largest mahogany forest in East Africa, as we search in the high forest canopy for these intelligent primates that are our closest relatives. Tracking a noisy chimp family is a thrilling experience and is best when they come down from the trees onto the forest floor to forage. The chimps are very mobile, so viewing can be quite unpredictable, but the walk itself is enchanting. This forest also has a wide variety of bird life. In the afternoon enjoy game viewing in Murchison Falls National Park and a boat ride on the Nile River. Note: Chimp tracking is limited to small groups, so our group may be spilt into two - with half doing the game drive in the morning and the chimp tracking in the afternoon (and visa versa). Please be aware that the chimpanzees move a lot - sometimes far into the dense forest - so wear good walking shoes and expect to walk a lot today (up to 3 hours). Don’t forget your binoculars, as if the chimps don't come down from the trees you will need these. This morning we depart from Murchison Falls and return to Kampala. Along the way we stop at Ziwa Rhino Sanctuary, home to the only wild rhinos in Uganda, where you can enjoy an included rhino walk, before continuing to Uganda's capital city. Note: Optional dinner in Kampala. Another full day on the road today as we travel 8-hours to Lake Bunyonyi - meaning "Place of Many Little Birds" and the second deepest lake in the Great Rift Valley. Lake Bunyonyi is a small but attractive lake, with steep sides and abundant birdlife. Ringed by mountains, the lake is best known for its dense otter population and stunning scenery. As the lake is free of bilharzia, it is safe for swimming. Rise early today to travel 2.5-hours to Bwindi Impenetrable Forest National Park - home to half the world's population of critically endangered mountain gorillas, and also a sanctuary for colobus monkeys and chimpanzees. This dense equatorial rainforest is accessible only on foot and features one of the richest ecosystems in Africa, including 120 species of mammals, 350 bird species including hornbills and turacos, 220 butterfly species, 27 frog species as well as chameleons, geckos and many other endangered species. It also boasts over 1,000 different floral species. As gorilla permits are extremely limited, we require flexibility in both the tour itinerary and where we actually visit them. At your specified gate, rangers will allocate you to a small group of up to 8 people. After a briefing, you will track a family of endangered Mountain Gorillas, accompanied by two guides - one at the front and one at the back. The group will walk at the speed of the slowest member, so it is important to proceed at your own pace and enjoy the experience. We strongly recommend hiring a local porter at a cost of around $15 per person, as not only is this an important source of local employment, but they will carry your backpacks and give you a hand up (or a push) where necessary. 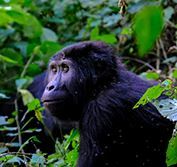 Expect to walk 1 to 4-hours each way in steep, sometimes muddy and dense tropical jungle conditions to view a family of these enormous primates and observe their behavior up close - a rare privilege indeed. You must take a copy of your passport with you today, as this will be required to trek. You must be over the age of 15 years to track gorillas and be sufficiently fit to walk for the period indicated. Ensure you arrange a packed lunch with your lodge and carry sufficient water in your backpack (at least 2 litres). You should wear long trousers, long sleeved top, long socks (tucked into your trousers to keep out biting ants), proper walking boots and gardening gloves to protect your hands from nettles and undergrowth. Start off wearing a light fleece, as it is cold in the forest in the morning and pack proper rain gear, including a rain jacket and waterproof trousers, as it can rain at any time. A walking stick to help with the steep ascents will be provided if you don’t have your own. You cannot be sick or have any infectious disease and no eating or drinking is permitted in the vicinity of the gorillas. Only one hour is allowed with the gorillas and you have to keep a distance of at least 7 metres. No flash photography is allowed and no touching the gorillas (although they may decide to touch you)! At leisure to relax on the shores of Lake Bunyonyi - giving us flexibility to change the date of our gorilla trekking in need. We will also visit Nyombi - a Pygmy Village reached by motor boat from your resort. Here you will have the opportunity to learn more about the culture of these forest dwelling people. Today we return 7-hours from beautiful Lake Bunyonyi to the bustling city of Kampala - crossing the equator along the way. On arrival check into your hotel and relax in your warm surroundings. Note: Optional dinner out in Kampala. This morning we drive from Kampala to Jinja, which offers many exciting activities. At Jinja the River Nile flows out of Lake Victoria and begins its epic 4,150 miles (6,700 km) journey to Egypt and the Mediterranean Sea. Most activities are focussed around the river - including thrilling white water rafting, kayaking and boat rides on Africa’s largest river. Those less inclined to water activities can enjoy horse riding or quadbiking on dry land. Today we leave Jinja and, after completing customs formalities, re-enter Kenya and travel 7-hours to Eldoret. The Great Rift Valley is the dominant geographical feature of this region as we arrive in Eldoret, the country’s 5th largest city situated at 7,000 ft (2,100 m) above sea level and home to many famous Kenyan long-distance runners. Today we travel 6-hours from Eldoret to Nairobi, the largest city in East Africa region, with drop off at your hotel at the end of our overland adventure. In the evening there is an optional meal out to swap stories and exchange contact details. Transfer to Nairobi Airport for your flight home.